Medium Stainless Steel Kennel Cup with Bolt Clamp -- approx 60 oz.. $12.99. "Too big for my truck intermediate crates." At 7.5 inch in dia., it is too big for my truck intermediate crates. Will use them in the house crates which are large size. Will order smaller kennel cups for travel crates. "Nice way to get the dish off of the floor of the kennel and keep it clean." Excellent product. Nice way to get the dish off of the floor of the kennel and keep it clean. Only concern is I hope it doesn't rust. Obviously the dish won't, but the cradle itself. Only time will tell. The feeder works well. I was a little concerned because the frame does not hold the bowl quite level, but it is secure enough, and the price was very reasonable. The product is mounted on a fairly heavy chain link kennel. "Perfect for our kennel and our sweet new puppy." Perfect for our kennel and our sweet new puppy. "Works great and keeps the food and water off of the ground." "The product works very well." The product works very well. For clearance purposes, realize that the product will actually extend a little over an inch more than the dish diameter due to the space between the dish and cage side. "Used nylon stainless locknuts in place of the wing nuts. Dogs haven't knocked them off the side of the kennel as of yet." Used nylon stainless locknuts in place of the wing nuts. Dogs haven't knocked them off the side of the kennel as of yet. I hope the metal wire frame holds up. "These bowls are decent, in the fact that they do what they are supposed to do. However, the water bowl allows you to only fill the bowl about 2/3 before it tips forward enough to start pouring the water back out." I bought these to keep the dishes off the ground in the kennel, and so I didn't have to keep transferring the inside dishes back and forth. These bowls are decent, in the fact that they do what they are supposed to do. However, the water bowl allows you to only fill the bowl about 2/3 before it tips forward enough to start pouring the water back out. The food dish works well, of course, due to the lighter weight. The finish is also on the lacking side. One of the wing nuts was VERY unfinished, hard to thread, and caused me to cut my finger while tightening due to unfinished imperfections and sharp edges. Overall, this works well for food, but I am still looking for a better water bowl alternative. Medium Stainless Steel Kennel Cup with Bolt Clamp -- approx 60 oz. Stainless steel water bowl / kennel cup clamps to wall, fence or crate door. 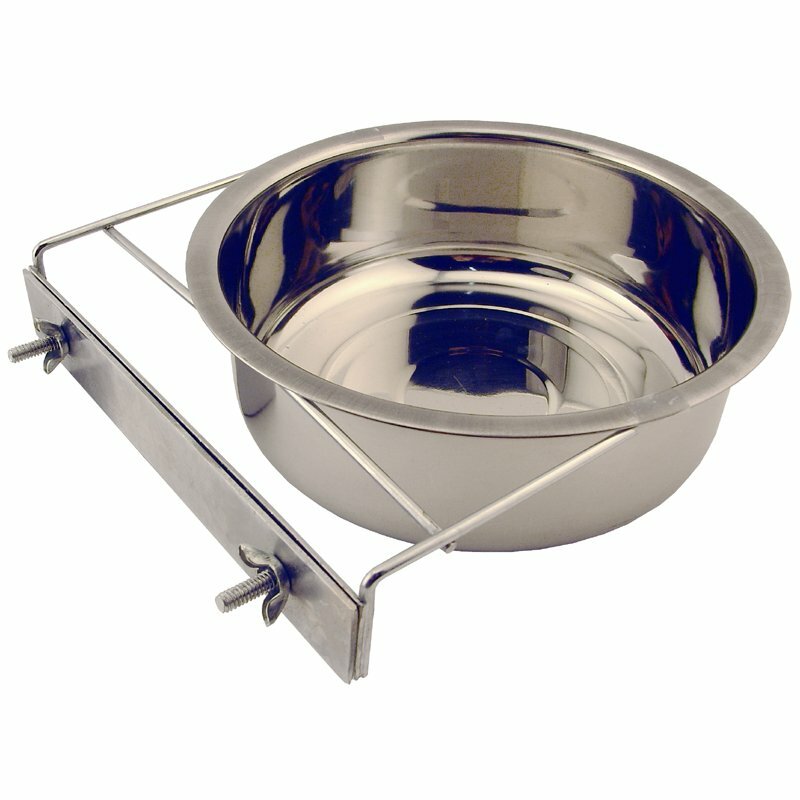 Top inside width: 7 1/2"
Large Stainless Steel Kennel Cup with Bolt Clamp -- approx 88 oz.